It's amazing how many people visit Oahu and spend their entire vacation in Waikiki, downtown Honolulu, and Pearl Harbor. These people are missing so much of what Oahu has to offer! It's a beautiful island and most of it is unlike anything you'll see in Waikiki. Oahu offers more than just shopping, nightlife, and hotels. Oahu gives visitors many opportunities to explore pristine beaches and verdant mountains and watch graceful hula dancers and big wave surfers in action, experiences that can only be found by traveling on and off the beaten path. Stay in the comfort of your air-conditioned car, or roll down your windows and let the warm tradewinds flow through your hair, and take some time to drive along Oahu's spirited neighborhoods, breathtaking coastlines and lush, green mountain ranges. Here are some scenic drives and secret beaches that you won't want to miss. Located just minutes away from downtown Honolulu and Waikiki, this drive takes you through a rainforest and the quaint neighborhood of Manoa and ends at a location where you can walk to a beautiful waterfall. The road from the freeway that takes you into Manoa is University Avenue, which goes through the University of Hawaii campus. Along University Avenue, East Manoa Road, and Oahu Avenue, you'll see charming historic homes and lush greenery in a valley surrounded by beautiful mountain ridges. Points of interest in Manoa include Manoa Marketplace, Manoa Valley Theatre, a Chinese cemetery, Manoa Falls, and Lyon Arboretum, home to more than 5,000 tropical plant species. The road along Oahu's southeast coast winds along magnificent sea cliffs. Points of interest along this drive are Hanauma Bay Nature Preserve, Koko Head Regional Park, Halona Point and Halona Blowhole, Sandy Beach, and Makapu'u Point. From Makapu'u Point, you'll see two islands known as Rabbit Island and Turtle Island, and on a clear day, the Island of Maui can be spotted along the horizon. Hanauma Bay Nature Preserve is dedicated to protecting and preserving marine life in the bay. While snorkeling is enjoyed, Hanauma Bay's main purpose is to educate the public on Hawaii's marine environment. Emphasis is placed on appreciating and understanding the bay and its marine life. From town, take the Pali Highway and head to the lush Windward side of Oahu. Along the way, stop at Queen Emma's Summer Palace, foreign consulates, Royal Mausoleum Hsu Yum Temple, Tenri Cultural Center, and Oahu Cemetary. Further up the road stop at the Nu'uanu Pali Lookout for breathtaking views and vistas of the Windward coast and the rugged cliffs of the Ko'olau mountain range. From the Pali Highway, venture to Kane'ohe Bay to visit the He'eia Fishpond, which was used by ancient Hawaiians to store fish for food and to allow fish to reproduce. From the Pali Highway, you can also journey to Kailua town or head to Kahekili Highway. 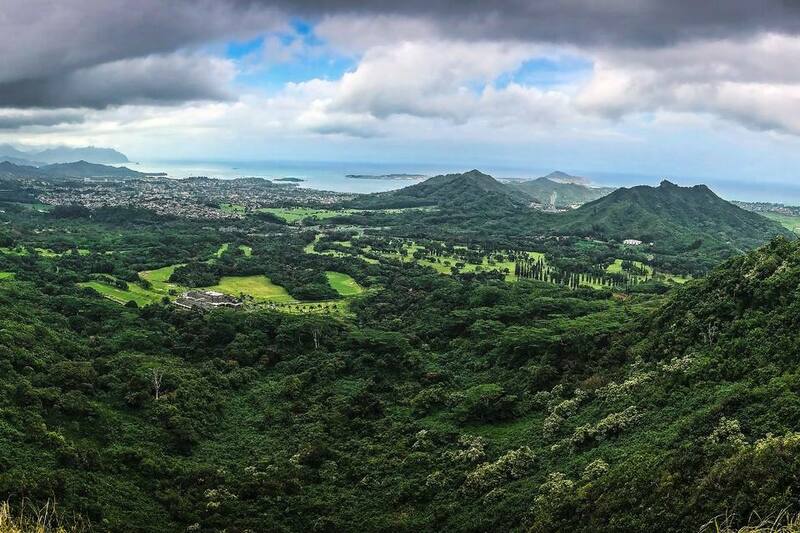 For some of the best views of Honolulu, take a drive on the road that circles Mount Tantalus. The road is narrow and has several hairpin turns with beautiful homes along the way. On the way up to Round Top Drive, you can stop at The Contemporary Museum and Punchbowl Crater, which contains the National Memorial Cemetery of the Pacific. More than 30,000 military veterans are buried here including Astronaut Ellison Onizuka. At the top of the drive is Pu'u Ualaka'a Park lookout, which provides spectacular views from Honolulu to Wai'anae. For a glimpse of rural Oahu, drive down Kalaniana'ole Highway through the small town of Waimanalo. As you get deeper into Waimanalo, you'll see dozens of farms, ranches, and nurseries that raise local vegetables and fruits and flowers. Catch a rodeo at New Town and Country Stables, watch a game of polo at the Waimanalo Polo Grounds, play a round of golf at Luana Hills Country Club, or relax on the white sand at Waimanalo Beach. On Kahekili Highway, stop at the Valley of the Temples and see Byodo-In Temple, a replica of a famous ancient temple in Japan. Further down the road is the expansive Senator Fong's Plantation and Gardens, which visitors can tour on a rickshaw. Continue on Kahekili Highway, which becomes Kamehameha Highway, to Kualoa Ranch where many blockbuster movies and popular TV shows have been filmed, including Jurassic Park and Lost. At Kualoa Ranch, you may also visit a garden and ancient Hawaiian fishpond, learn about ancient Hawaiian navigation on an ocean voyage, or tour the expansive property by horseback, ATV or jungle expedition. While most visitors to Hawaii are familiar with Waikiki, Waimea Bay, and Lanikai, Oahu boasts several other spectacular beaches along its 112 miles of coastline that are not as well known. Be advised that some of the beaches have seasonal strong currents and big waves, so caution should be taken at all times. Located below the Halona Blowhole parking lot, this special spot is never crowded due to the treacherous climb down to the sand. But for the intrepid, what a treat this spot can be. The break in the ocean cliffs and the surrounding crags provide protection from the wind. Rough open-ocean waves roll up on the beach but unlike Sandy's, a gently sloping sand bottom takes much of the punch out of them before they hit the shore. Turtles frequent the small cove, seeking respite from the otherwise blustery coast. It's great for packing a lunch and holing up for the day. Located in historic Hale'iwa on the world famous north shore of Oahu, Ke Iki Beach is the perfect beach to kick back and relax. Far from the hustle and bustle of the city, Ke Iki beach provides visitors with peace and quiet. Beachfront vacation rentals are available for prolonged rest and relaxation. This is truly the place to go to "get away." Located on the southwest corner of Oahu, White Plains Beach fronts Kalaeloa Point, the former Barber Point Naval Air Station. Picnic areas, a snack bar, showers and restrooms along with gentle surf and soft sand make for an enjoyable time for the whole family. Visitors can access this white sand beach by taking H-1 and exiting on Kalaeloa, then driving toward the military housing. Parking is available along campgrounds. Located on Oahu's Waianae coast, Yokohama Bay is a long stretch of secluded sandy beach that is a great place for picnicking, hiking, shore fishing and watching spectacular sunsets. The surf is calm during the summer and is a popular spot for snorkeling, diving, swimming, and shell collecting. But when the surf is up during the winter months, "kooks" (novices) are advised to stay onshore to watch some of the world's best surfers tackle 20-foot waves. Visitors can access Yokohama by taking the H-1 West until it connects to Farrington Highway. The beach is located at the end of Farrington Highway.